Bonjour lecteurs! Our weekly photo is from our holiday in Spain. We are now back and we had such a great time! Not only I had the chance to catch up with a great friend of mine but we also relaxed for good. You might have noticed that I was totally quiet on our channels. I decided to switch off and enjoy some well-deserved quality time with my loved ones 🙂 And Baba had a blast too! We visited my friend’s house and it was full of toys as she has two little ones. 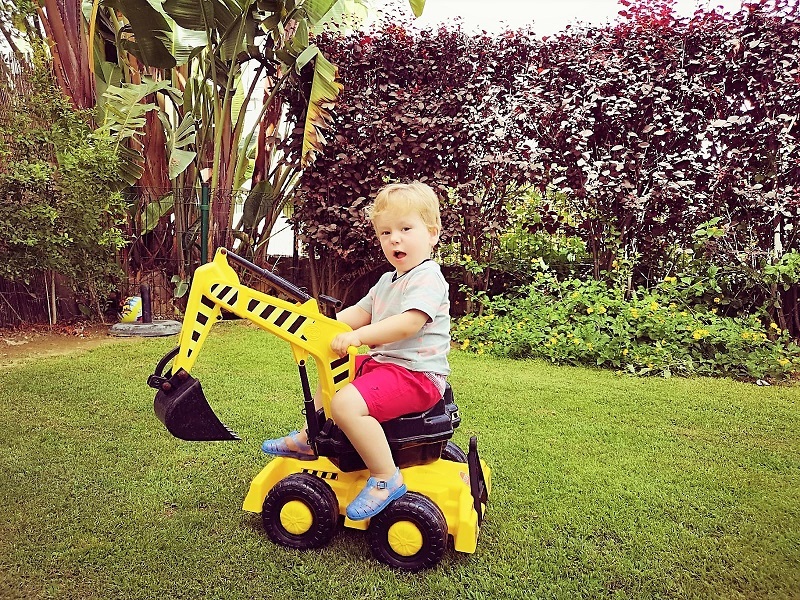 As soon as Baba arrived, he found the bulldozer and there was no way we were going to take him off that! If you have never visited Sotogrande, go on and book something down there right now! It is such a beautiful place with many fab beaches and much more. The port is also fab for kids with a mini-fair! I hope your week will go well! Thanks for reading Living Arrows 31/53! Top from Gap Kids, shorts from Jacadi and shoes from Hugo Boss Kids. Baba looks like he’s having great fun on the bulldozer ? Aw bless him, It’s fab when they find a toy they get hours of enjoyment out of! So cute! Hope you have a great summer. Lovely place to enjoy the great outdoors too! Wish i’d had one of these when i was little! Sotogrande looks beautiful on the link provided too!